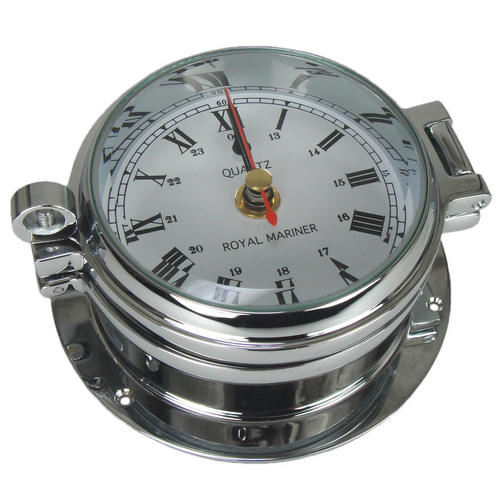 A port hole style boat clock with quartz mechanism, white dial face, hour, minute and second hands and Roman Numeral digits. 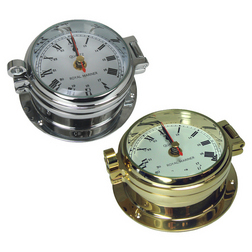 This port hole boat clock has a white dial face with either Roman Numerals (Brass clock) or English numbers (Chrome plated Brass clock) and three hands; hour, minute and seconds. Easy to install with three holes evenly spaced around the base. The clock face opens on a hinge to reveal the clock mechanism so changing the battery is hassle free and when closed is held in place by the 'port hole' screw.